Meeting ID is the meeting number associated with an instant or scheduled meeting. The Meeting ID can be a 9 or 10 digit number. The 9 digit number is used for instant, scheduled or recurring meeting. The 10 digit number is used for Personal Meeting IDs. Instant Meeting ID ends when the instant meeting ends. You can start your scheduled meeting at any time after you scheduled it. Non-recurring Meeting ID will expire 30 days after the scheduled date or started date, if the meeting is not recorded. You can also re-start the same Meeting ID within the 30 days. If a meeting is recorded on the cloud, it will expire 90 days after the meeting is started. Recurring Meeting IDs will not expire unless it is not used for 365 days. For PC: your Meeting ID is displayed on the top center of your Zoom meeting window. If you are in full screen mode, press Esc to see the Meeting ID. For Mac: your Meeting ID is displayed on the top center of your Zoom meeting window. If you are in full screen mode, press Esc to see the Meeting ID. For iPad and iPhone, tap on the screen to display the Meeting ID. Note: If you click on Invite, you will see the Invitation URL: zoom.us/j/123456789 - the numbers (9 digits) shown is your meeting ID. 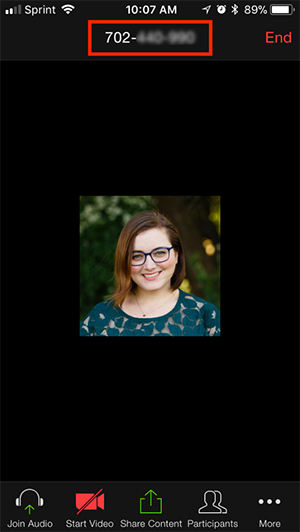 If you click on the particular topic, you can also find the Copy the Invitation. You can copy, paste and edit in your email, IM or calendar invitation. 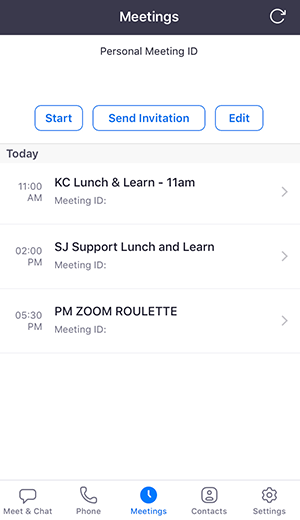 You can also view, start, edit or delete your upcoming Meeting IDs on the Zoom App. Click on the Meetings tab.